​Since his critically acclaimed Carnegie Hall debut, cellist Wolfram Koessel has embarked on a diverse career as a soloist, recitalist and chamber musician, performing internationally in the world’s most distinguished concert halls. 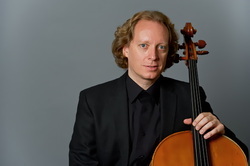 STRAD magazine wrote of "the exceptionally attractive cello playing of Wolfram Koessel" who has established himself as a sought-after musician, performing concertos with the Jupiter Symphony, the New York Metamorphoses Orchestra (which he co-founded in 1994), Jerusalem Symphony, the Osaka Symphony, the Mannes Orchestra and symphony orchestras in Stuttgart, Cordoba, Mendoza, Costa Rica, Iowa, and New York. In 2006 Mr. Koessel joined the American String Quartet with whom he performs regularly at the Berlin Philharmonie, Amsterdam's Concertgebouw, Köln Philharmonic Hall, Metropolitan Museum of Art, Kimmel Center, among others. He has performed with artists such as Rene Fleming, Richard Stolzman, Edgar Meyer, Menahem Pressler, Zakir Hussain, Ute Lemper, Sharon Kam, Jeremy Denk and many more. Based in New York City, Mr. Koessel appears with a wide range of ensembles and chamber music groups such as Orpheus Chamber Orchestra and the New York Philharmonic. Upcoming performances in 2019/20 will lead Mr. Koessel to Japan, Germany, South America, Spain, Canada, Mexico and across the United States. He is a founding member of the group Trio Ink, with violinist Yosuke Kawasaki and pianist Vadim Serebryani.